Ananka's Diary: Japanese Battle of the Bugs! 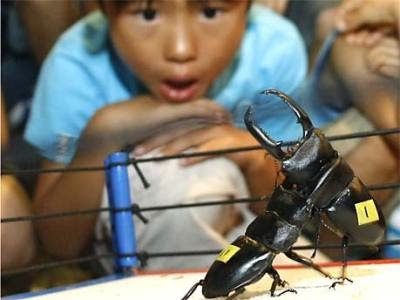 Beetle battles are a centuries-old tradition in Japan and other parts of Asia, where rhinoceros beetles are often kept as pets. (Hey, at least you don't have to walk them or clean out their litterboxes!) Every year, the biggest, baddest bugs compete in Insect World Battle Championships which are held in Tokyo. Don't worry, animal lovers. The bugs don't get hurt. The fighting is just their way of looking good for the ladies. See the battles in action below. This is actually the only thing on this blog I've heard of before... but I didn't know some people would pay a thousand dollars for a bug!